Ten thousand runners flooded the streets of downtown Hamilton for North America’s oldest road race. The 125th Around the Bay Race took place Sunday morning, drawing people from all over the world to our city. As soon as the horn went off, a sea of people raced down York Boulevard. A stampede that marked the first few steps of the thousands needed to complete the 30 kilometre course. The same distance from downtown Hamilton to Oakville. Rocks!! Runners Ready to go! Tricia, Vince, Ken, Lynn, Nicole and Deb. Lise is taking the pic. It snowed during the night and the winds picked up significantly putting a bit of nerves into early morning run preparations. True running conditions turned about to actually be quite favourable for most. The temperature held between 0 and +2 for the morning and while winds were very high the direction from the northwest actually favoured the course layout. Most of the blow was from our backs in the exposed sections and we were protected by trees, hills and structures when the wind was into us. Roads were a bit wet to dry and there was no snow on the actual course. I believe course support is actually improving as the run ages. There are more available water stations and definitely more porta johns than in earlier years. The Pot Bangers in Tin Pan Alley through the beaches area are getting new life as a younger demographic is enthusiastically taking over from the old folks who were beginning to be unable to get out and provide support. The north shore is always populated by great supporters. The top of Lasalle Park hill at 21k is absolutely raucous. I really enjoy running through there high fiving as many youngins as I can slap hands with. There is a famous private aid station at the 23 k mark as you go upgrade to Plains Rd. Jan and the Northshore Blvd. neighbours created a water and fruit station over a decade ago. It's been such a success that runners absolutely expect it. Thank you Jan. Next up at the 24k mark the West Plains Church Choir serenade and cheer us on after their church service giving runners a special push on our way along the route. For 27 years Stan Wakeman has been a fixture on the Valley Inn Hill playing Queen's "We Will Rock You". Listening to the music and seeing his smiling face is something I look forward to every year. I stopped and let him know this year what an impression he has made and continues to make on tired runners as they prepare to tackle the final hill. He informed me his first outing was in 1993. I hope to keep on seeing him in years to come. Tim 'the Grim' Reaper is a star now. He's even got his own paintings for sale at the expo. You can find Tim every year by the graveyard at the 28km mark beckoning the weak to give it all up and just stop at the cemetery. It's become quite a selfie station in the last few years. We finish indoors at FirstOntario Place which is the best when it's a bit nippy. This year for the first time I'm aware of they served a local beer for all who finished. A very nice touch - even if I don't imbibe. I love this run. Yes, it's a bit hard but it's also very special. I hope to go back again next year. Congratulations to all our Rocks!! 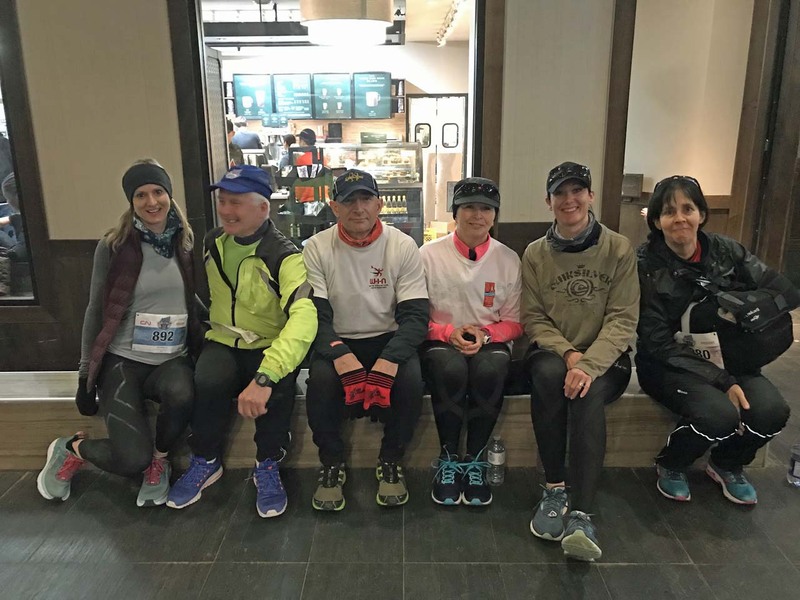 and friends who took part in the 125th annual Hamilton Around the Bay 30k and 5k. 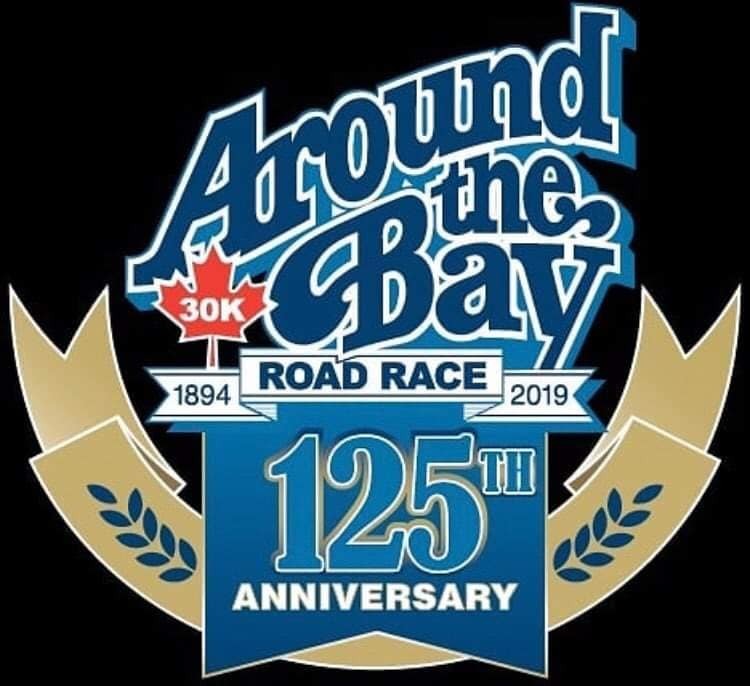 If running 30 kilometres on a Sunday morning doesn’t sound appealing, the Around the Bay also has a 5K race. Alex Drover from Kingston ran it in a breezy 15 minutes coming in first place, a big jump from last year when he came in ninth. The first place woman finished the 5k in 17 minutes and 37 seconds. She finished first last year too. While some are running to beat their personal best, for others, just being able to participate is a big milestone. Some of the runners here today never thought they would be able to accomplish something like this. The historic road race bringing together not only the greatest runners, but also the most determined of people.